While she celebrated my birthday with Seizan's Sukiyaki, I on the other hand booked a table for 2 at K’s Restaurant on hers at my friend’s recommendation. It is a French/Japanese fusion restaurant tucked at the corner of Northbridge, Perth and I would have to say it was an excellent reference by my friend. 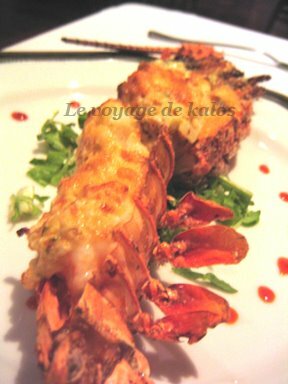 K’s restaurant has 3 set of set menu - K's menu, K's Deluxe menu and K's Crayfish menu. 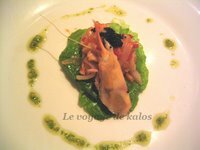 There isn't any ala carte menu, which is good sometimes since you do not need to make much decision - only how much you are willing to spend. Since being her special night, we decided to pamper ourselves with the crayfish menu. 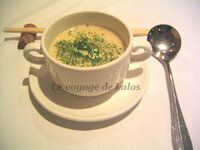 We started off with the asparagus soup which was fine but if you looked at the picture closely, you would realise that the interesting part is not about the soup, but more on the chopsticks on a cork cut into half. I thought that was a pretty neat idea. And besides, where else could you find a setting of a pair of chopsticks next to a metal spoon except at K's restaurant. Next, comes the prawn and jellyfish marinated in some sauce which is unique. 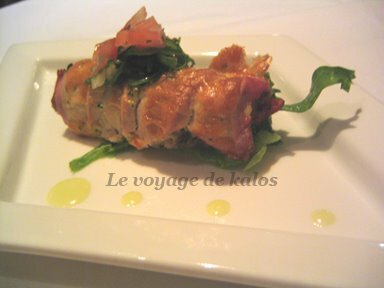 However, I was beginning to understand where the French part of the cuisine is showing - the display of the dish itself than anything else. This was followed by some meat rolled with seaweed - which tastes quite well but I did not quite like the texture though as the meat roll makes it kinda tough. Of course up next comes the star attraction of the night - the crayfish. With its side topped with cheese. The dish was done to excellent perfection. The side with cheese was baked in nice golden brown while the meat inside was soft and moist. For the mains, we get to have a choice of either the lamp chops or the beef steak. As I was craving for lamp chops, I opted for it while she took the beef. 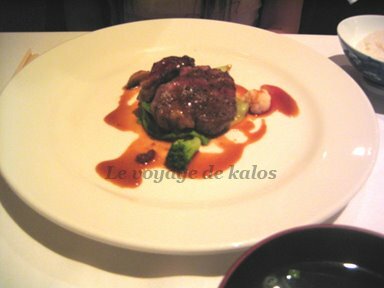 As she went for the medium, the meat was not as juicy as I would have preferred (I would normally go for medium rare). My lamb was however great except that the portion wasn't exactly filling if not for the mash potato under it. 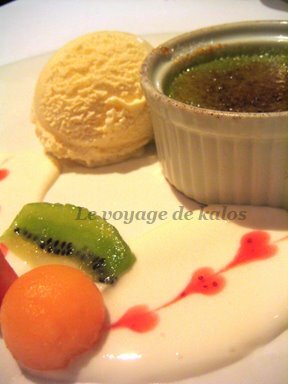 While it was time for dessert, the Japanese waitress insisted enthusiasticly that we choose the green tea Crème Brûlée. As we were wondering what is so wonderful about it, our first taste of it completely dispel all doubts about her recommendation. What a dessert to round off a wonderful night.